Messi received a pass from Xavi in his own half, dodged two players and sprinted towards the Getafe goal. He then swerved past two more defenders before rounding the keeper to score from a tight angle. "I saw the space and went for it as I always do. I saw Samuel (Eto'o) was in a good position to do a one-two as I neared the area but with two defenders nearby, so I took it on myself," he explained. The fact Messi's was in a King's Cup semi-final as opposed to a World Cup quarter-final was perhaps the only detracting factor from the youngster's strike, though he carried the ball at a greater pace. The goal dominated the front page of Thursday's sports newspapers. Diagrams of the numbers of players passed and the distances covered were thrown up to make minute comparisons with Maradona's effort. 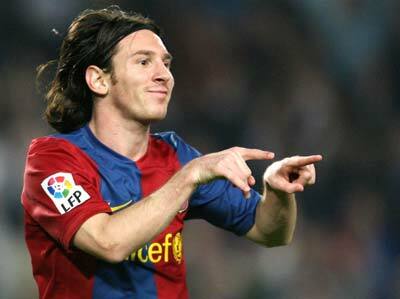 Messi celebrates after scoring the outstanding goal. According to a football enthusiast, 'Messi beat five players; he covered covering 48 metres in 12 seconds, taking 10 touches with his left foot and three with his right. Barcelona-based daily Sport said "Messi Superstar" on its front page while the Marca Web site led with "Messidona." Coach Frank Rijkaard described the move as a "work of art." He is a real good player .But he's prone to injuries.. He plays with a style more like zico than maradonna.But very poor on dead ball skills. "Commit all your crimes when Mohanlal is acting. They will go unnoticed because even the Lord is watching,"
"U CAN SEE N NUMBER OF EMOTIONS FLASHING THRU HIS FACE WITHIN NO TIME.., THATS HIM..OUR OWN LALETTAN"
i am not a fan of football...speacially club football. so.. i am not going for a choice. i am not a fan of football...especially club football..